21DFC Day 1 – It All Begins! This is Day 1 of the 21-Day Fitness Challenge (21DFC) for Feb 2012. View all posts made during the challenge: 21DFC Overview. As of the writing of this post, we have 242 official participants here with us on the challenge (including me)!!! *whistles* *dances* *dance* That’s 242 of us ready to rock our bodies, sweat it out, and embrace a thinner, leaner, healthier us at the end of the challenge? Are you ready for that OR WHAT? If you have not signed up yet, where have you been?! Hurry over to the announcement post, sign up there, do your pre-work (Day 0’s task), and get started on your fitness regime now! (Update Feb 6: Sign ups are now closed). For the 241 of you who have signed up (refer to: official participants list), make sure you’ve done your pre-work first. Then, continue reading! As I mentioned from the start of the challenge, I started 21DFC because I intended to get back into the exercising gear myself after returning from my travels. Hence, I’ll be taking part in 21DFC with all of you from Feb 3-23. 😀 Throughout the 21 days, I’ll be openly sharing my progress in the next 21 days – no holds barred. From intended exercises, to obstacles, to personal victories, I’ll be sharing them via the daily 21DFC posts. I hope through my sharing, you’ll find it a source of inspiration in excelling your 21DFC! In order to share my exercise logs in time for the daily 21DFC posts, I decided to start my 21DFC 1 day earlier. Meaning while Feb 3 is the official Day 1 for the challenge, Feb 2 is actually my Day 1. It’s really semantics, though – at the end of the day, it’s about exercising (or being physically active, for those who dislike that word!) for 3 weeks straight, and thereafter successfully cultivating this habit for life. So Day 1 of 21DFC! I slept somewhat early the night before (10+pm or so), so I ended up waking up at 3:30am and wasn’t sleepy anymore. After using the computer for a few hours, I decided to kick off my 21DFC with a jog/run. What I love about my home is that there is a park connector right behind it – which is great for jogging/running (if it’s not raining). The park connector I’ll be running in regularly for the next few weeks. I ran early in the morning while it was still dark – this picture was taken after my jog. 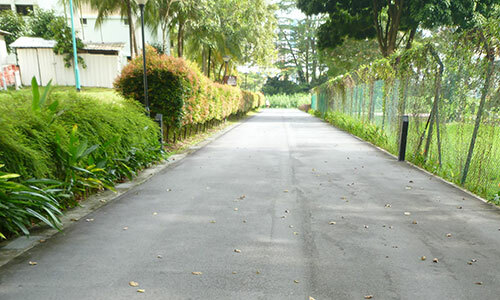 This is only the start of the trail; it goes for a very long way, connecting different neighborhoods together. For those of you who read my 2011 year end review, you may recall me wanting my 2012 to be a year of intuition. 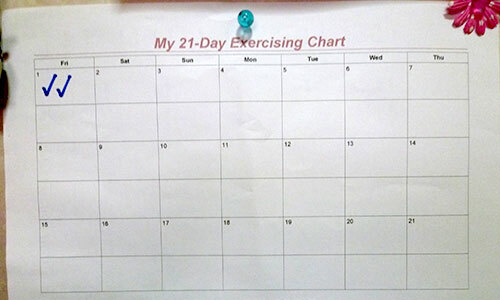 And that was the reason why I didn’t specify any activities for my 21-day exercising chart (not yet, anyway). I wanted to focus on the intention to be more active, then decide what to do for each day as the day unfolds/when the thought strikes me. Anyway, the reason why I mentioned that is because I only decided to run/jog after I woke up at 3:30am. As I prefer to jog when it’s dark and more cooling (I don’t understand how people can jog when the sun is scorching hot), I was out barefoot jogging at 6:30am. I didn’t pre-set a target distance to jog/run. Rather, I allowed myself to run however fast/slow and however long I wanted to. It turned out to be a great strategy, because I enjoyed the jog/run far more than I’ve ever enjoyed my jogs/runs. Throughout the run, I focused on enjoying the dewy scent of the morning, watching the other people walking/running/exercising on the park connector, and watching the sky slowly lit up as dawn broke over the neighborhood. Anyway, normally I would have called it a day after a jog like that. But I decided to step it up a notch, since I was in the grove. In the true spirit of the 21DFC pledge, of “push[ing] my physical limits to where it has not gone before”, and to make 21DFC really count, I decided to go for a swim – after my jog. Note that I wasn’t disciplining, forcing, or even remotely making myself do that. 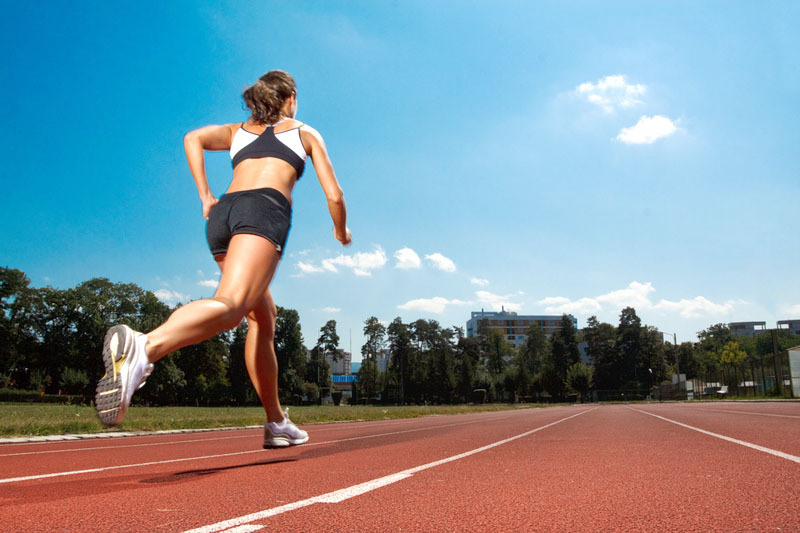 Long-time readers of PE would know that I do not believe in self-discipline – I see it as an unsustainable, heavy, and exhausting way of achieving goals. I just genuinely, truly wanted to swim after my jog. In fact, while I was jogging, I kept thinking about how great/fun it would be to swim after I was done. So to the pool I went! Funnily, I didn’t let that thwart my desire to swim. I did feel momentarily halted by it, but I refused to leave the pool or end Day 1 without my swim. I thought about buying a new pair of goggles, but the particular pool I went to didn’t have a shop. I thought about borrowing from one of the lifeguards, but somehow I didn’t think it was a request they would jump at. 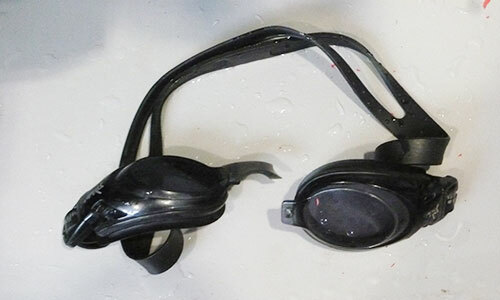 So after a minute of pondering, I decided to swim anyway – without my goggles. I simply kept my head above water as I did my usual laps – alternating from breaststroke to backstroke. I couldn’t do free style since it required my head to be under the water, but it was okay with me. At the end of my swim, I had finished 20 continuous laps (in an olympic size pool), had a somewhat sore neck, but was extremely happy with my performance. And off I went for my lunch. Oh, guess what – It started pouring after I finished showering, and the rain lasted for a good 2 hours. Learning of the day? Always take action when you get the opportunity, and don’t wait till it’s too late! How About YOUR Day 1? Share Your Progress! The above is my log for Day 1. How about yours? How did YOUR 21DFC Day 1 go? Did you get to complete your scheduled activity? Did you achieve any personal victories? Did something unexpected crop up, which made you learn some valuable personal lessons? Regardless of how your day went, I want to hear it all. 21DFC is not about sharing ‘flawless’ fitness progress, but about sharing everything our journey towards a healthier, fitter life – obstacles and all. Post your day’s journal in the comments section! If you have any images to share, simply upload them to Photo Bucket or Imgur first, then include the link(s) in your reply.